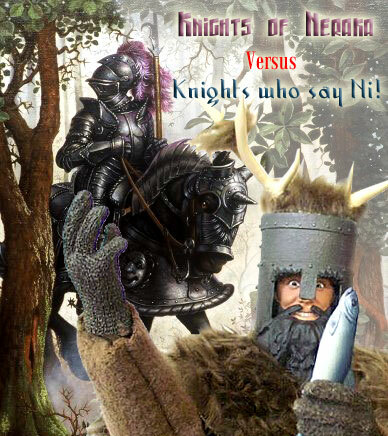 Knights of Neraka VS Knights who say Ni! This Rumble ended on 2004-06-01 00:00:00.0. Voice over: Commander Khedriss Mennarling of the Knights of Neraka Strike Force makes his way with his companions hauling behind them a covered wagon through the forest. When all of a sudden they are confronted by a pack of strange looking wild men in furs and antlered helmets. Knight of Ni: We are the Knights who say..... "Ni"! Mennarling: (Wincing against the sharp noises of their voices.) Who? Mennarling: (Winces again in annoyance) You are knights? Knight of Ni: Yes, we are the Knights who say..... "Ni"! Mennarling: (Winces from the sound) Knights who say Nee? Other Knight of Neraka: Who are they? Other Knight of Neraka: I’ve heard of them. Those who hear them seldom live to tell the tale! Knight of Ni: The knights who say "Ni" demand..... a sacrifice! Mennarling: Sacrifice? We’re not giving up our lives! (turning to his men) Uncover the Death Machine and prepare to fire! Knight of Ni: We shall say "Ni" to you... if you do not appease us. Mennarling: Well what is it you want? Mennarling: Shut Up! You all must be insane! That word is burying into my head like an axe and giving me a splitting headache. (Other Nights of Neraka start rubbing their head and nodding.) Stop it now or you will become the new test subjects of our death weapon. Knight of Ni: You must return here with a shrubbery... or else you will never pass through this wood... alive. Mennarling: What in the Abyss would you do with a shrubbery in the woods!?!? Knight of Ni: When YOU have found the shrubbery, you must place it here, beside this shrubbery, only slightly higher, so we get the two-level effect with a little path running down the middle. Mennarling: Uhmm.. yeah. Ok boys let’s unleash the weapon.